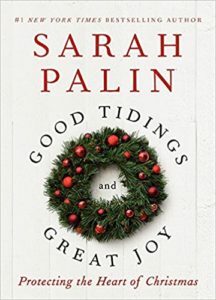 Just as quirky as all get out, Sarah sure knows how to spin an Alaska yarn that will get you riled up about the WAR ON CHRISTMAS. There is nothing like some snowflake saying Happy Holidays to really exorcise the Jesus right out of THE LORD’S BIRTHDAY. Next Book: Accidentally in Love With…A God? by Mimi Jean Pamfiloff or Pamfie as we now call her. This entry was posted in Uncategorized on April 3, 2017 by Becky Selengut.